Here we provide details of other equipment you may require for creating your own video recording and photo capture system. There are literally hundreds of makes and models of webcam available, offering a wide range of features and recording qualities. We cannot guarantee that every webcam will perform perfectly with our software on every configuration of computer, therefore if you already own a webcam we strongly recommend that you first download the RightBooth evaluation to see if it works with your particular equipment. 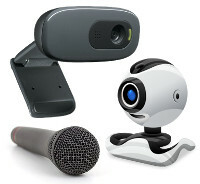 If you are looking to purchase a webcam, then first take a look at some of our findings. Often you will achieve better video and photo recording quality if your subject is well lit. A great way to achieve this is by applying direct lighting from at least one USB light source. USB lights are great value for money and provide excellent quality light. We have used the Nikon D7100 (opposite) for all our development and testing of the DSLR features in RightBooth. Therefore we can recommend this camera if you would like to record videos and take photos in RightBooth using a digital camera. We would love to hear from you regarding using your DSLR with RightBooth. The RightBooth software can be customised to work with your Keyboard, Mouse, Touchscreen and with one or more USB Buttons. Asking your users to 'press a button' is often an easier option than asking them to click the mouse or press the spacebar on the keyboard. A USB button that is compatible with RightBooth can be obtained from www.usbbutton.com. This button simply plugs into a free USB port on your computer and it can be configured so that it controls RightBooth when the button is pressed. The button can also be configured to light up with different colours. In order to configure the button so that it works with RightBooth, we include a USB button configuration file (rightbooth.ubn) with our software. This file should be loaded into the USB Button Configuration utility which can be downloaded from www.usbbutton.com. If you would like to use 3 or 4 monitors in your RightBooth event designs you will require a multi-head graphics card capable of providing multiple graphic outputs. ​There are many makes and models of card available, and each one has different connection requirements, so we cannot really recommend any particular card as it depends on your PC equipment. We used the Sapphire GPRO 4200 (opposite) for all our multi-display development and testing in RightBooth. This card provides 4 mini display port outputs, so we also used mini display port to VGA adaptors for connecting our VGA monitors. ​We also use laptops configured for extended desktop dual display using their secondary VGA or HDMI outputs.